Good morning, friends. I know you were expecting an update on Thursday, but it turned out our simple ultrasound was a bit more complicated and life altering than we were expecting. Sure, we anticipated it being emotional. We knew it could reveal something good or bad that would affect the rest of the pregnancy, but we went in, hoping and expecting the best. We were not at all expecting what we actually got. So it’s Wednesday morning and we’re up earlier than we need to be, getting ready for our 9 am appointment. We’re excited and nervous and can’t wait to see our little one for the first time. We leave by 8 and get to the office by 8:20-ish. Apparently traffic into Monroeville is non-existent at 8 am. We have to wait, obviously, while the person before us has all their things done and we fiddle with our phones and half watch whatever home improvement show was on the TV in the waiting room. Finally it’s our turn and we’re called back to the room and introduced to our ultrasound tech and a the student who was observing. Everything’s going as expected thus far; they ask us some questions, including if we want to know the gender, and I hop up on the bed, expose my belly and off we go. The gel was warmer than I was expecting. I was really expecting it to be cold like what they used for the heart beat thing in the OB’s office, but no. They warm it up for you in the ultrasound room. A pleasant surprise to start us off. Logan and I watched the screen in front of us as our tech moved the wand around, just getting a feel for where everything was. We see shapes flash around the screen, a hand here, a head there. Yup, looks like a baby to me! Great, no idea what any of the odd shapes mean, but we’re going to find out. “No we’re not!” is my immediate response. Not entirely because I think she’s lying. Why would she lie to us? But the sheer impossibility of us having twins was slow to loosen it’s grip on my mind. Twins happen to other people, they don’t happen to you. 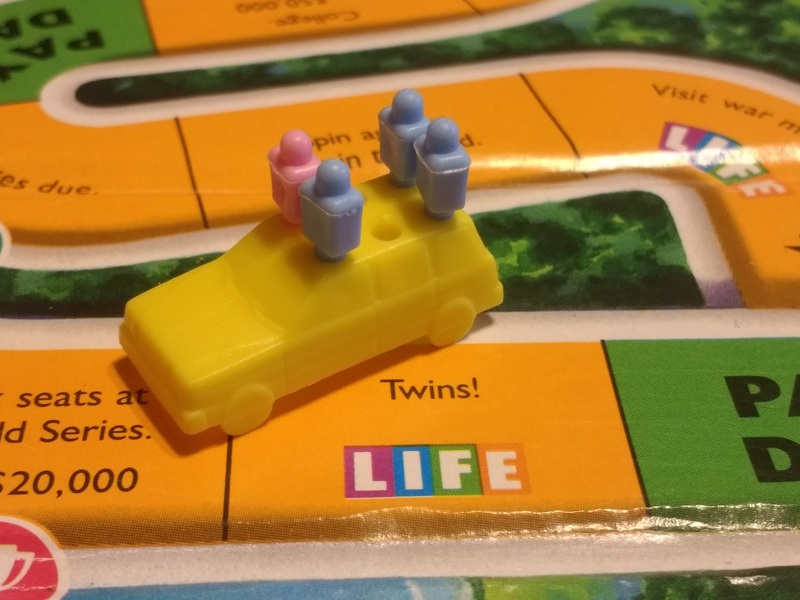 We don’t have twins in either of our families that we knew of, so twins were never on the table, despite all the teasing I got about how many babies I was carrying. It was never a real possibility! “I would not joke about a thing like this,” Our very patient tech informed me kindly. I knew she wouldn’t, and I knew she wasn’t, I could see the two little heads on the screen as she told us. They were both there, right in front of me, two little babies moving around. Logan just laughed as I freaked out all over the place, switching between laughing and crying and just general disbelief. The student got us each a cup of water and let me sit up and drink it while they did the preliminary look around. There was shaking as I kept looking at Logan and saying “There are two of them. Are you okay? There are two of them!” Finally I had to lay back so we could get the whole anatomy scan underway, and try to hold still as I continued to laugh and shudder and cry a little as we watched her measure the first of the twins. I didn’t really break down until we were done with Baby A and I was allowed to get up and pee and walk around a little before we started on Baby B. Something about that pause, being alone in the bathroom with silent space for it all to sink in opened the flood gates and I sobbed when I came out and hugged Logan. I wasn’t upset, mind you. We are both so excited to meet both of our little ones, but the sheer overwhelming thought that for 20 weeks now we’ve been expecting one baby and now there are two was a little much for me to handle. So he held me as I sobbed and the student grabbed us some more water and we finally had to get back to work on measuring Baby B. They took pictures and videos and our tech explained what was going on and what she was doing, probably to the student, but it was nice to hear and focus on the technical side of what was happening. We were assured that they both looked good and Logan got his turn to freak out a little while they did all the measuring and entered all the data into their system to be sent to my doctors. We left the ultrasound office an hour later than we had anticipated with a promise of emailed pictures and videos and the knowledge that we were having not one, but two little boys. So that was our ultrasound surprise! And the surprise for everyone else in our lives as well, though apparently half of them saw it coming. My mom was suspicious of how fast I was growing. One of her best friends had twins and the whole thing seemed strangely familiar. We called everyone once we left the office, of course, and they were all over the moon excited for us. My sister is mostly excited that she’s getting the nephews she wanted. The second one is just a bonus. My dad just laughed and said “Oh gees, Bekah” when I told him. Apparently he has cousins who are twins that I never knew about. Similarly, when I told my mom she revealed that my grandmother always told my aunts that twins were a possibility. That might have been nice to know when we started out. Not that it matters, since our boys share a placenta, which means they’re most likely identical, and identical twins aren’t genetic, they just sort of happen, from what I understand. Long story short, we’re in for an adventure. It took a lot of processing and a few calls, but we’re set up with yet another new OB, since they don’t do multiples at all at the midwife center, and we’ll be seeing them on Thursday. We’ll see if I remember to blog when I get home from our 9 am appointment and possible breakfast date. After all we’ve been through this past week, I think we deserve a breakfast date. And all the pancakes. And chocolate. I had plans to blog about Halloween and stuff, but really, who can think about holidays when we suddenly have two tiny boys to plan for? Welcome to my world of all things twins for a while. Hang on tight, it’s going to be a bumpy ride!